At Walden, our goal is to help you reach yours. Our complete suite of student services is here to support your success and is designed for busy, working adults like you. We’re here to give you guidance so you can confidently thrive in your degree program and successfully achieve your goals. Discover the Walden difference today. At Walden, we believe in making online education personal. That means every one of our student services is backed by a world-class support team that can help you reach your goals as a Walden student. If you need anything at all, please don’t hesitate to contact us. We’re just a call or click away. Our advisors are here to help you at every step of your academic journey. From determining financial aid options to mapping out a plan for success, we’ll be there to guide you. Enrollment - As you begin to explore Walden, our enrollment advisors are here to serve as your guide. Get information about programs, the online learning experience, admission requirements, the online application process, and more. Financial Aid - Before you enroll, financial aid advisors will work with you to identify the resources available to help fund your education. Academic - As a student, you’ll be assigned an academic advisor who will answer your questions about university policies and procedures, help you acclimate to the online classroom, track your academic progress, and guide you through a wealth of student resources. Call 855-646-5286 to speak with an advisor and learn more about admission requirements, transfer of credit, and more. If you’re looking to change careers or advance in your current one, let us help you plan the next steps. From pre-enrollment through graduation, we’re here to support your success. Webinars, videos, and expert advice on searching for a new job, exploring career options in your field, starting a business, building your professional brand, and more. Professional assessments that identify your strengths and skills. OptimalResume, a career management system featuring self-guided tools to help you revise your résumé or CV, write effective cover letters, and create an e-portfolio. Strategies for conducting strong interviews, evaluating job offers, and negotiating your salary. We can help you navigate Walden’s online learning environment and assist you with any administrative and technical issues, 24/7. 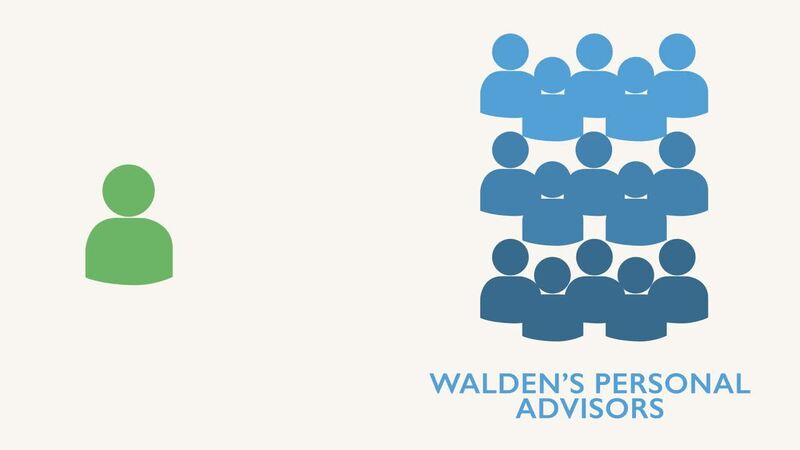 A self-paced online orientation that introduces you to Walden’s online platform. Technical support 24 hours a day, seven days a week. Assistance in locating textbooks, assignments, and other learning materials essential to your studies. Support in accessing other Walden student resources. You can connect with Walden’s Student Support Team by phone, e-mail, and online chat. From the online classroom to in-person residencies, we strive to meet accessibility needs and provide a seamless experience for all students. Granting qualified students extra time to complete assignments and tests. Offering course materials in alternative formats, including enlarged text or text read aloud by software programs. Renting specialized equipment, such as electric scooters and Hoyer lifts, and hiring local service providers, such as sight guides, sign language interpreters, or captionists, for qualified students attending academic residencies. If you have questions about our Disability Services, please contact us at disability@mail.waldenu.edu. You’ll have anytime access to 3 million dissertations, more than 164,000 electronic books, more than 64,000 full-text journals, and 100-plus databases. Our Online Library also includes tutorials and webinars to help you use research tools and resources more effectively. Guidance on the research process. Assistance in developing search strategies and tips on effectively navigating databases. Direction on finding resources outside of the Walden Library. As a Walden student, you’ll have access to a wide range of online services and the advice of trained research staff. Whether you’re looking for an article to supplement your required reading or conducting scholarly research for your capstone or dissertation, our library and Center for Research Quality can assist you. Our Center for Research Quality promotes the highest academic and ethical standards in research. From your first course to your dissertation, the center provides guidelines and sample projects to support your success. Identifying grants, fellowships, and other sources of funding for your research projects. Submitting your research to Walden’s Institutional Review Board (IRB) to ensure it conforms to the highest ethical standards. Finding resources for publishing and presenting your research. Whether you’ve been away from the classroom and need to refresh your skills or simply want to improve your work in a certain area, we’re here to help. We offer personalized support and tutoring services as well as online tools and courses to help you achieve academic success. Available in Walden University’s Academic Skills Center, our academic skills courses, seminars, and workshops can help you strengthen your skills in a particular area that impacts your current coursework. Credit is granted for most academic skills courses but does not apply toward online degree program requirements. Courses focus on such topics as graduate writing, APA style, and critical thinking for social change. View the course descriptions for quarter and semester courses. The Academic Skills Center offers individual tutoring support in multiple areas, including statistics, math, and Microsoft Word. New doctoral students can also request a doctoral peer mentor to receive tips, guidance, and advice from experienced Walden doctoral students. Advice on the writing process, from concept to final draft. Free tutorial services on APA style, grammar, and more. One-on-one consultations on course papers. Recommendations for additional writing guides and resources.